4 bedroom, 3 bathroom villa in the Sandy Ridge community. Owned by david woods. Ref: 1779. 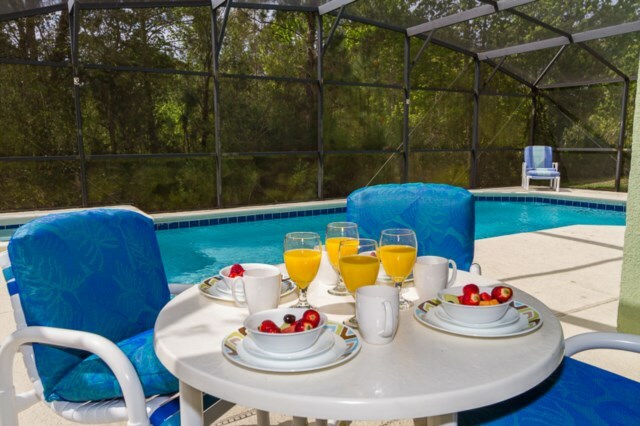 **FLORIDA VILLA PARADISE** Vacations just don’t get any better than this. 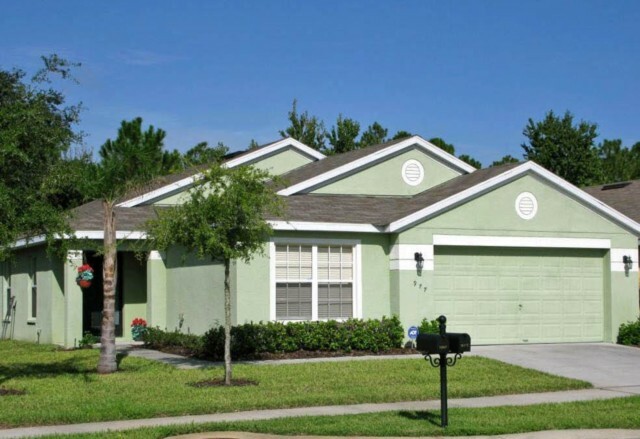 A Wonderful 4 bed/3 bath executive villa in one of the best locations in Orlando. Families & couples will simply love what this villa has to offer. 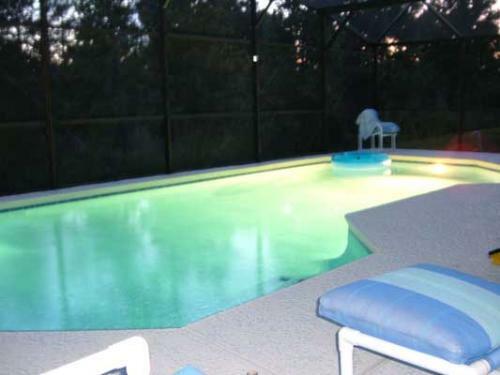 A huge 30ft x 15 ft pool with LED lights & Jacuzzi/ spa with a large pool deck. Overlooking Conservation for ultimate privacy and surrounded by landscaped gardens. Furnished to a very high modern standard featuring a living room & separate family room with Widescreen LED Internet 3D Tvs. An open plan kitchen/ breakfast nook, 2 master beds with ensuites & 2 twin beds with ensuite. 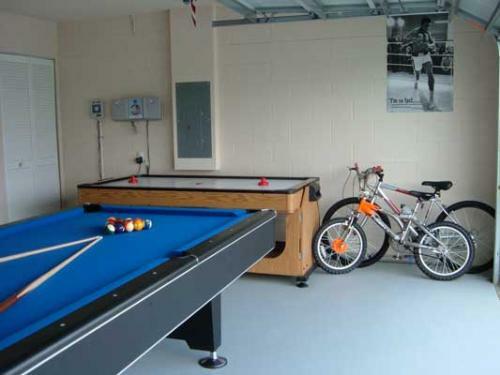 A superb games room with a new high quality Slate bed pool table, air hockey, foosball, X-Box 360, PS2, mountain bikes & many more extras. Stereo sound system installed in the Pool deck area and in the Games room. Free Highspeed WiFi internet with computer, free local & international phone calls, free use of a BBQ. 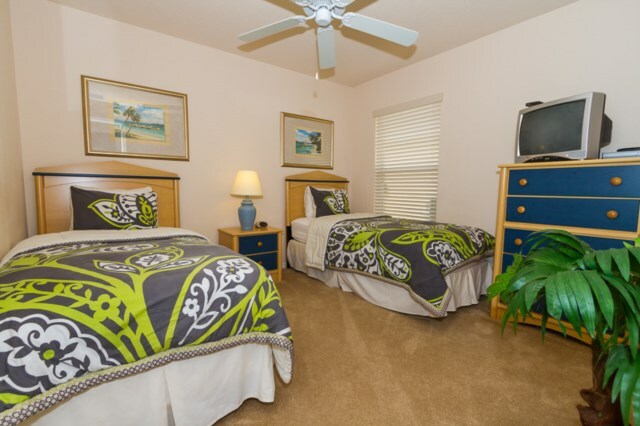 Just 10 mins to Disney & 2 mins to the world famous Championsgate Golf Complex. We had a fantastic holiday in David Woods Florida Villa in Davenport. It was just as the advert said. Spacious, clean, well maintained, everything in working order, with all the facilities you would need for a 5 star stay. Close to all the Florida attractions and an easy drive to get there, which I was very glad of as never having driven in the US previously I was a bit concerned. However all the directions and instructions given by David provide invaluable and resulted in a stress free stay. This is the 4th Time visiting your villa Dave and I can honestly say I wouldn't choose anywhere else. We have had such an amazing time in Florida and your home has been such a wonderful place to come back to after a long day at the Theme Parks. Here's looking at trip no5 in 2015. 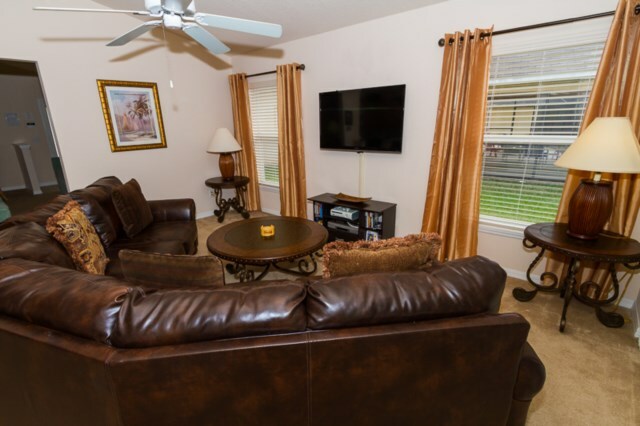 Both rooms are very spacious with high vaulted ceilings and have TVs and DVDs with the living room having a PS2 for the kids to keep them occupied while you relax in the family room watching a film, reading a book or listening to a cd. Patio doors in the family room lead out to the lanai and swimming pool. 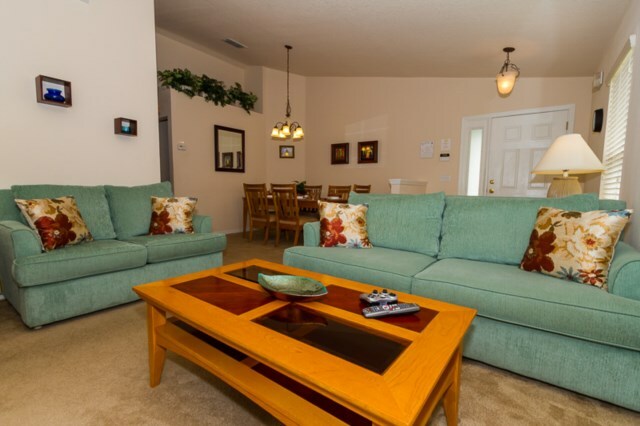 Both rooms have comfy sofas to relax on with the living room having a queen sized sleeper sofa to accommodate 2 guests. 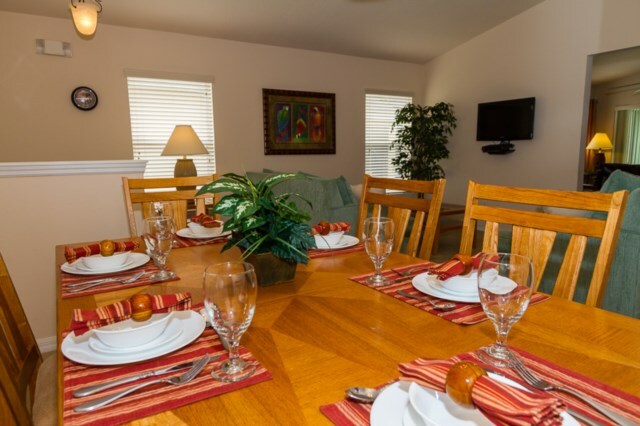 The formal dining area seats 6 people and is open planned with the living room and there is plenty of space. 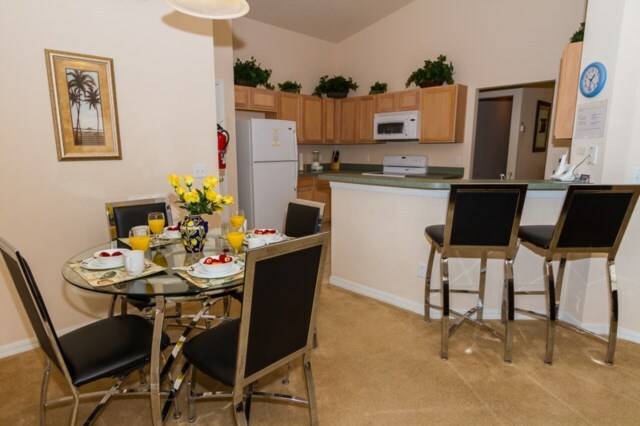 The Kitchen is also open planned in its design and is superb with all the latest appliances which include Electric self cleaning range oven, microwave, Maytag refrigerator with ice Maker, built in dishwasher. All utensils including cups, plates and glasses are supplied as well as toaster and coffee maker. There are bar stools by the breakfast bar and also a breakfast nook with a table and 4 chairs for a nice relaxing coffee in the morning. There is a laundry room next to the kitchen with a washer and dryer supplied and also storage for the iron & ironing board. This beautiful room overlooks the pool area and has a QUEEN sized bed with quality bed linens and a large walk in wardrobe. There is a remote controlled tv/dvd player, telephone and alarm clock. A ceiling fan is fitted for your comfort and relaxation. There are also extra drawers for storage and a wardrobe as well. 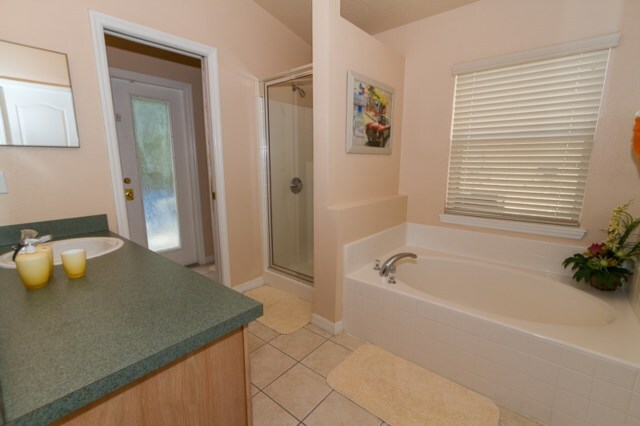 The ensuite bathroom has a large oval bath, twin mirrored vanity washbasins, a large walk-in shower and toilet. You have the use of a hairdryer. There is also a door that leads out onto the pool area. This room is also furnished to a high standard with a queen sized bed, quality bed linens and a walk in wardrobe with plenty of storage. There is a cable TV in the room and radio alarm clock. There are also wardrobes and bedside drawers for extra storage along with a ceiling fan to keep the room cool. The ensuite bathroom features a large walk-in shower, a mirrored vanity washbasin and toilet, also you have the use of a hairdryer for your convenience. The room has a large window which overlooks Sandy Ridge drive. Both these rooms have twin beds with cable TVs, DVD players and radio alarm clocks. 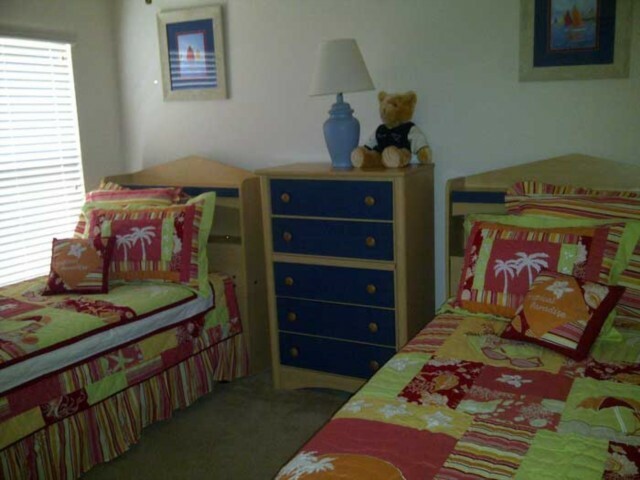 Both the bedrooms are furnished to a high standard and again both have bedside drawers, wardrobe and ceiling fans along with quality bed linens and walk in wardrobes. The ensuite bathroom serves both twin rooms and has a large bath/shower, toilet and mirrored vanity washbasin. Again you have the use of a hairdryer. 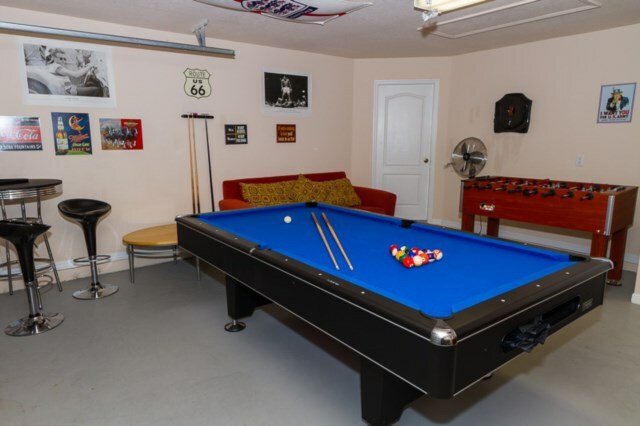 This room will entertain everyone; this superb games room has a pool table, air hockey table, foosball and an electronic dartsboard so you can challenge dad, brother or sister to your favorite game. Don’t forget as well there are plenty of board games to keep you occupied. This area really has the “WOW” factor and oozes class. Featuring a 30ft x 15ft heated swimming pool and spa with underwater lighting to suit your mood. Just imagine after a hard day at the theme parks relaxing in the Jacuzzi spa with a glass of your favorite wine or champagne. Remember also that because you have conservation at the back of the villa it is very private. The pool also features extended decking for more room and sun loungers to top up your suntan. There is also a table and 4 chairs for al-fresco dining. 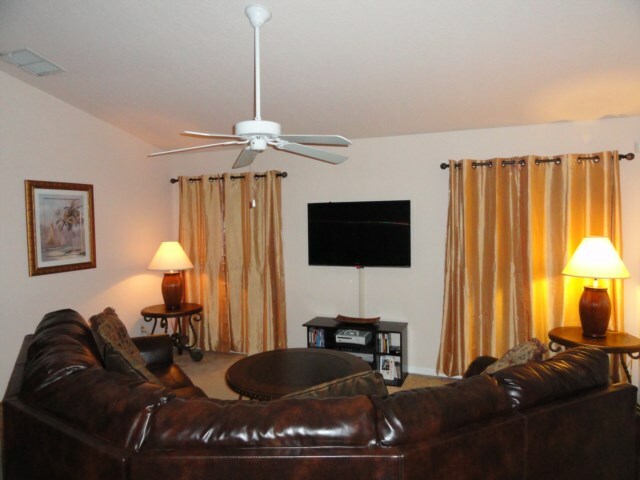 Finally a covered lanai offers relief from the heat of the sun with a ceiling fan and lighting. For your peace of mind there is a child safety fence you can use when the pool is not in use. All in all I think you will agree that this villa is a bit special. We want to make your vacation an unforgettable experience and welcome any comments/feedback from our guests and remember our management company are on your doorstep and are available 24/7. In the unlikely event of you experiencing any problems you can contact them straight away. 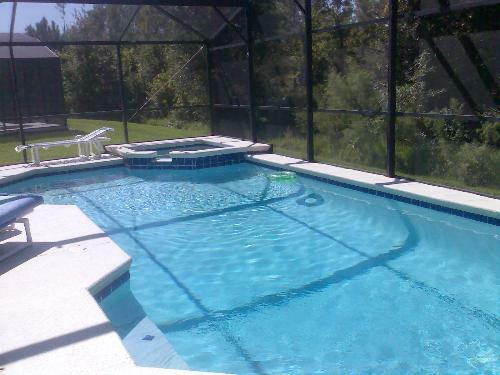 POOL HEATER (OPTIONAL) £100 $170 per week for the pool and spa. All prices include local taxes, cleaning prior to arrival and after departure and also all utilities. Discounted rates are available for 3 weeks stay or more please email for details. Stays of less than seven days will incur a charge of £50 $85 for cleaning. Your booking will be confirmed on receipt of your booking form along with a 20% non refundable deposit. Your enquiry will be sent to villa ref 1779 only. This page has been viewed 91552 times since 08 Nov 2004.